“This book is a valuable guide to parents and teachers who want to teach the younger generation about American and world history through an exploration of Ellis Island and the immigrant experience. 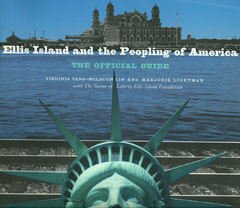 It places Ellis Island within the context of the worldwide history of immigration, and as a continuing social process. It can prepare one to visit the Ellis Island Immigration Museum, guide one in the process of doing a family genealogy, or direct one to many more sources for immigration study. It will prove to be an important contribution for immigration scholarship.” —Lee Iacocca, founding chairman, The Statue of Liberty-Ellis Island Foundation, Inc.
Over 3 million people visit Ellis Island, the “Golden Door to America,” every year. Ellis Island has become an invaluable resource center on immigration and genealogy as well as a national tourist attraction, widely praised for its excellent displays and informative exhibits. Now, the best of the Ellis Island Museum is available to readers everywhere from the Ellis Island-Statue of Liberty Foundation. Fascinating primary-source documents offer an exciting overview of Ellis Island, placing it in historical context with a concise history of immigration and global migration. This comprehensive guide is a must for anyone interested in immigration in general and Ellis Island in particular. Virginia Yans-McLaughlin is a historian at Rutgers University. She served as an historical advisor to the National Parks Service and the Statue of Liberty - Ellis Island Foundation on the creation of the Ellis Island Museum.